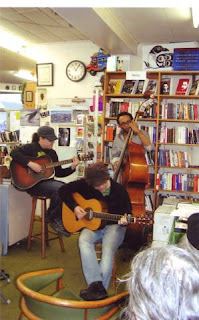 Michel Marchildon performing at Gulf of Maine Books. We had an afternoon "Rendez-Vous" with song, poetry and prose, all in French. One of the poets later described the event as being like "a City Lights happening." We have just received, on the same day, new collections by three of my favorite writers:Selections - Miyazawa Kenji - edited by Hiroaki Sato ( in the Univ. of California Poets For the Millenium series, which also includes titles - in stock here - by Andre Breton, Maria Sabina, Paul Celan, and Jose Lezama Lima), Mandarins - stories by Ryunosuke Akutagawa - translated from the Japanese by Charles De Wolf and published by Archipelago Books, and The Selected Poetry and Prose of Andrea Zanzotto, a bilingual edition, edited and translated from the Italian by Patrick Barron (we also carry his anthology of Italian Environmental Literature) and published by the University of Chicago Press. I have been a fan of Ryunosuke Akutagawa since the early 1970s, when I read his story Hell Screen in Donald Keene's Modern Japanese Literature, and later his famous Rashomon. His new collection, Mandarins, translated by Charles de Wolf, has 13 stories, two of them appearing in English for the first time. He was called the "father of the Japanese short story" and wrote some wild poems as well. He died at the age of 35, from an overdose of barbituates. Andrea Zanzotto has spent most of his life in northern Italy, in Pieve di Soligo. Patrick Barron, his editor/translator says that his poetry creates "something of an impossible yet highly focused map, lacking fixed itineraries but providing an intense understanding of the vibrating, interwoven, and concentrated vitalities that stretch, tension-filled, from lauded/abused woodland, to rareified alpine heights, to thoroughly humanized countryside." Zanzotto himself says " My village is like a garden, here and there devastated, map and palimpsest, gestures fixed in an eternal instant, a blinking of eyes, a sudden opening of narrow streets that are always here and yet curving elsewhere." "Here is where I see the exceptional role of poetry: to confront the numerous lies and forgeries and to pull the masks off of the delusion-sellers' faces by affirming the truth that is buried under piles of commercialized and repetitive language, and to delve to the bottom of the deepest oceans to capture the jewels of speech."